The toolbar still shows if the page does not exist. This should only happen if the page is deleted after it's first added to their openTask cookie. S:GS has a length check (which implicitly includes checking that the page exists). Thus, this is worth fixing, but shouldn't be that common. bzimport set Reference to bz50033. I tried to replicate this on piramido.wmflabs.org by deleting a page I had just been served correctly via Special:GettingStarted with the toolbar and then returning. I still had the openTask cookie associated with that task/article, but the toolbar did not display on the redlink view (&action=edit&redlink=1). I did, however, get the guided tour. however, get the guided tour. I think that's because it's action=edit. 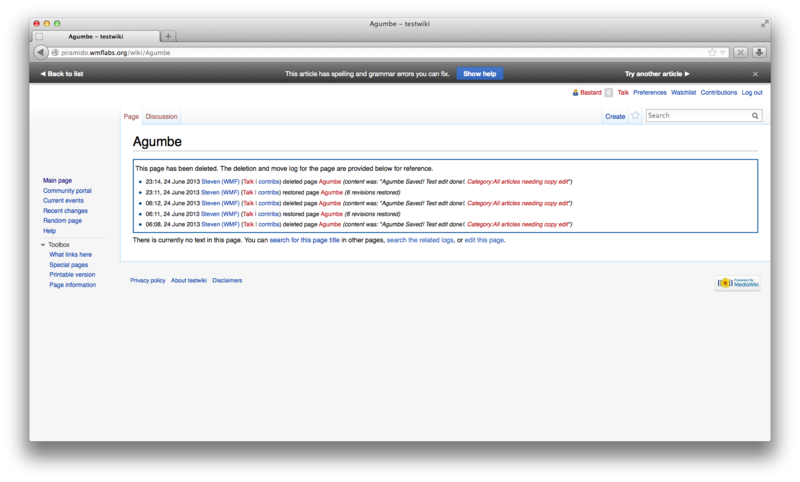 If you visit directly (/wiki/Article), without action=edit, you should be able to reproduce. > however, get the guided tour. (/wiki/Article), without action=edit, you should be able to reproduce. Bingo. Will attach screengrab for verification. Don't show toolbar if page does not exist.